Robin is a short slice of life game that was made to give some visibility to an invisible illness - Chronic Fatigue Syndrome. What you decide to do in the 3 days is up to you, but know that there is never such a thing as a perfect ending. Robin was made by a group of 2nd year game design students at Media Design School. Windows: Unzip the folder and run Robin.exe file. Mac: Unzip the folder and run Robin Mac Version. I just want to preface this with I love this game, it's gorgeous and I understand this was done for school so obviously not everything could be included but these are just some thoughts. Chronic Fatigue Syndrome in more then just 'being tired', theres muscle and bone aches, theres vomiting, often teenagers will also have POTS which will cause fainting, and these are just a couple things. And there's so many other things that come along with it. This game is amazing but doesn't even touch on social problems, family issues, mental health issues, work/school. Because it's invisible theres so much self hate (which is touched on in the beginning) and misunderstanding with other people, I've lost friends over this, had relationships fail, sacrificed my health to go to school yet have come out worse for it. I've been to rehab, there's no cure, but just putting the important things first, but also realising those important things aren't always school/work. This was heart-wrenching and comforting, and it helped me forgive myself for my roughest days. Thank you. such a powerful game. Definitely recommend. I like it, thank you so much for this experience. Thanks for the game. Interesting approach to discover this problem. Finally, after several attempts, I reached the best "happy with productivity, has hope for the week" ending, and I am happy beyond words. :) Good idea, pleasent graphics, engaging game. First, before I write this review, I just want to apologize in advance to those who will watch my video. I realized I did not take the subject matter as seriously as I should've and I want to let you know how sorry I am. I will make sure to be more serious when I play games like this. This game is pretty good. I like how the game puts you in the shoes of someone who is suffering from CFS, It helps the player get a glimpse of how someone suffering with CFS goes about their day. It's a clever and creative way to use video games to raise awareness and to put things in perspective. There should really be more games like this. If you wanna know what I'm referring to, I suggest you play the game yourself. As someone with CFS, it was really heartwarming to see this game. Thankyou. I felt an incredible urge to never let my bird friend go unfed, at the cost of my own physical and mental health o-o I have no regrets ever. This was a neat little game, with a great message! Thanks for making it! Howcome i cant download omg!!!!! so fustrating!!!!!!???? Was a great game explaining the life of a CFS person. Loved the concept and made a small video about the game. I played this game from your gamejolt page and I didn't realize it was on here too! Just wanna say that this was a nice game and experience. I knew about CFS and this brought more of an insight on the life of someone who has this syndrome. Good job on the execution! "Robin" was a great little experience of an Indie game! I had heard of Chronic Fatigue Syndrome in the past, but I never really got more of an understanding of it until playing this game. 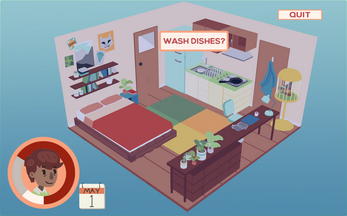 Not only was it educational, I also really enjoyed the mechanics and the art direction of the project; it made everything so simple and relatable without being overly complicated. Kudos to you students at Media Design School, looking forward to playing anything else you guys make in the future! As an FMS sufferer, it was lovely to see someone put daily struggles into this format. I have self-diagnosed Chronic Fatigue Syndrome, and when I saw a play-through of this game on YouTube it made me feel validated and sympathized with enough to trigger bawling. That bawling and those emotions actually used up what little "energy" I was going to attempt to use to go out to eat with my husband tonight, who was looking forward to that meal all week. There's more to that than I'll say here, but yeah, another day stuck at home (like nearly everyday). 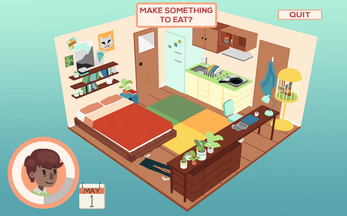 Every single day I play this game with my broken body and life, and the difficulty of making these types of decisions (minus working, which I haven't been able to do in years,) is only fractionally represented here, (but thankfully is). Because of what little I can do, (usually less than Robin here can,) I end up showering only twice a week on average. Three times a week feels like I'm making headway, and two days in a row makes me feel more normal than such a thing warrants. Often just showering and eating is all I can do in a day, if even that, (all too often it's only eating and going to the bathroom). The energy it takes to get up and make even a simple sandwich (with, sadly, disposable dishware and silverware,) is often too much, and at times I let myself go hungry for a bit, or not get up for the bathroom for a bit, because I don't want to use up that energy. I could go on and on. We built a house half a year ago, and I've been letting it get pretty dirty so that I can instead focus on trying to set it up, (hoping to put up at least one set of curtains this weekend). Folding laundry takes a whole day when I can do that, too. Social media is too stressful and exhausting, and even more is talking on the phone to a friend (just lost my last one,) and friends of course have their own problems, which I can't deal with, (not to mention others don't want to deal with mine). And books, or games, can be too taxing, (I binge on Netflix, sadly, which is my window into the wider world and a way to watch "people" for a greater social component to my life). Sometimes I feel paralyzed about making the right choices with pushing myself to do anything. I agonize over it. I agonize over what I can or can't do, and even after ten years of knowing something is wrong with my health I still daily accuse myself, or at question myself, of being lazy, or not loving my husband enough to try harder for his sake. But when I'm genuinely afraid of stepping into the shower for fear I won't be able to make it through to the end or of just crying through it, or I'm hanging onto the sink or counter for support as I brush my teeth or make food, or when I'm crying because I want to be and do more for my husband, or myself, and that I feel inhumane and like a needy baby, I know that I shouldn't be as hard on myself as I daily am. I feel worthless, and like a burden who should just remove herself from my husband's life so he can go and find someone better for him. Doesn't help I was emotionally abused all my youth and made to feel my only worth is in serving others selflessly. Yes, I feel suicidal because of my broken body at times, (never will though, don't worry). But it is encouraging to finally see some understanding and sympathy for those with my struggles, or those trying to get others to be more understanding and sympathetic (like with this game). It gives me some hope that I'll be more understood, and possibly helped, rather than be called (like I have) lazy, or accused of mooching off my husband, or keeping a dirty home, or of being a crazy shut-in, or of being somehow mentally ill. It pains me so much to be like I am, and then to face those accusations, both externally and internally, just makes it so much worse. Thank you for this game. I'm glad to know I can give people a little window into my tortured world through it. P.S. I used to have two pet birds that I felt very guilty about not caring for properly. At times I found, to my very guilt-ridden horror, that they had been for a day or two without water or food, and at times the smell of their cage would haunt me as I breathed it in on the nearby couch, (punishing myself by not moving further away at times). I'm not that kind of person, as bad and unforgivable as that is and seems, please believe me. One of them died of old age, happy and loved, and the other we had to give away a few months later in part because of my lack of better care, but mostly because he got so loud in his grief and loneliness after the first one's death, and I knew I had to give up on pet ownership, (though it has left a hole in my life and heart). If they were truly suffering because of me I'd have given them both away sooner, but they were surprisingly happy despite my unintentional negligence in those ways. So yeah, another way in which this game resembles my health struggles. I get more lonely without a pet, and I'd love to have my own dog like I've always wanted, but I simply can't be in charge of another's well-being when I can't take care of my own or my husband's. I have fibromyalgia and wow. 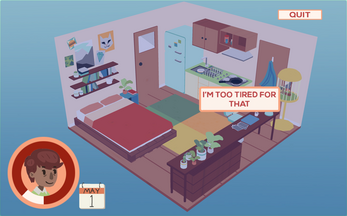 This was so intensely accurate, I want the world to play this and know what life with any form of chronic fatigue is like. Very beautiful game and experience! Love the art! I was thinking of making a game like this, but never has the energy to do it (ironic in a way). I don't have chronic fatigue, but I do have Crohns disease, which has side effects of malnutrition and constantly being exhausted. Things like showering only happen if I have to go out that day and it's been more than 48 hours. Washing the dishes and putting my clothes in the washer? Forget about it. I'm lucky to have someone who can pick up the parts that I can't, but even like that, life it tough. Thanks for making this game, its message is one that I can really relate to. I loved this game, even though it was short it had a great story and message. 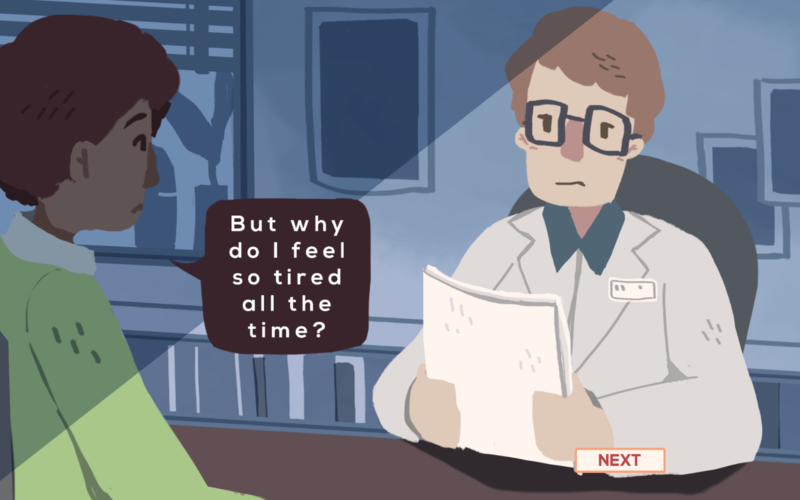 There's a lot of illnesses that aren't focused on and are left in the darkness, but this game shined light on Chronic Fatigue Syndrome, which before this game I had no idea existed. I hope games with messages like this one, keep getting made. A serious game and a serious topic. I had to check it out. Here's a review. You did a beautiful job at creating awareness for such an invisible disease. Thanks for this game! Is there a way to tip you guys or something? You've truly captured the power of games as a medium with which to experience life from a different perspective. Thank you all for the powerful experience, and for introducing me to Spoon Theory. Good luck in all your future projects.